Powered by Elk Studios, Valkyrie is a Norse mythology themed video slots 3D that takes you to the battlefield of Midgard where you’ll discover your true purpose. Will you be condemned to the flames of Helheim or blessed with life in Valhalla? The Valkyries, Gane, Helena, Andora and Tyrsa will guide you on your adventure. This 5x4 gameboard has 1024 ways to win and an unrivalled number of in-game features to enjoy. 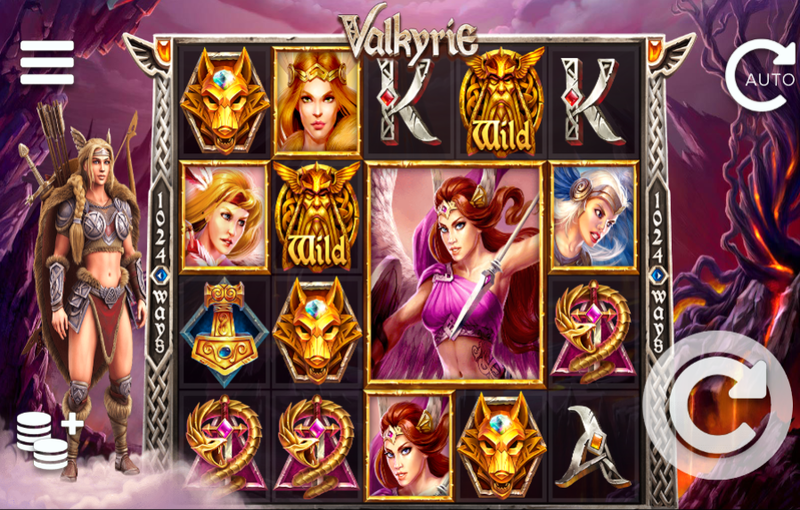 The Valkyrie Features, Valkyrie Free Spins, Wilds and Bonus Spins can take your cash prizes to new heights. Once you enter the Valkyrie slot, you’ll be greeted by an epic opening sequence that will blow you away. The bellowing narration of The Valkyries takes you into the battlefield of Midgard where you must fight to earn cash rewards. Let's have a quick view of our guide and select the best slots games based on your preferred category. The 5x4 gameboard offers 1024 ways to win across various symbols as well as epic reel symbols that appear up to 3x3 in size. The standard game symbols vary in pay-outs, starting with the lowest value symbols which are playing card icons from jack to ace. For medium wins, you’ll have to connect with the gauntlet, snakes, wolves and golden hand. The highest base game symbols are four Valkyrie warriors, Gane, Helena, Andora and Tyrsa. BONUS SPIN – Hit 3 or more Bonus Symbols to receive one re-spin in Bonus Mode with one randomly selected Valkyrie Feature. 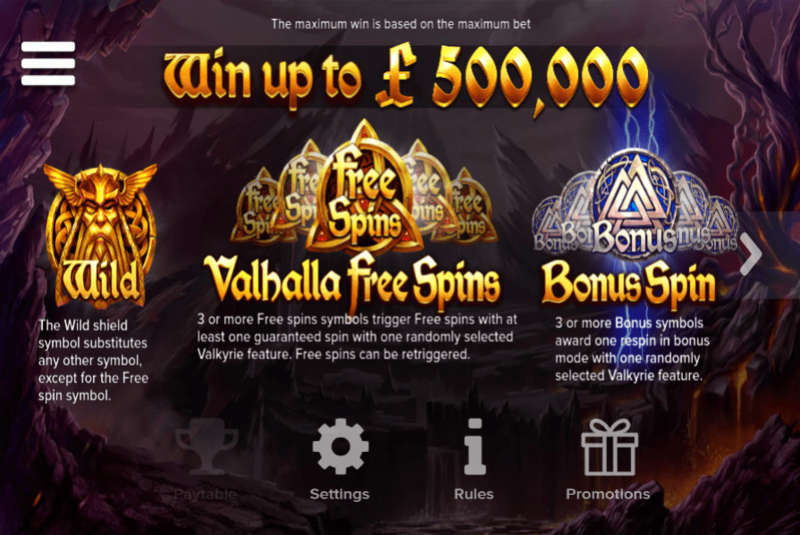 VALHALLA FREE SPINS – Hit 3, 4 or 5 Valhalla Free Spin SCATTERS to trigger the Free Spins Feature. You’ll receive 5, 7 or 10 free spins respectively. You’ll also be guaranteed at least one spin with one randomly selected Valkyrie Feature. VALKYRIE FEATURES – The Valkyrie Features can be triggered once you’ve activated the Free Spins Feature. If you trigger the Free Spins with 3, 4 or 5 SCATTERS, you’ll receive 1, 2 or 3 Bonus Spins. The more Bonus Spins you receive, the greater your chances of winning huge cash prizes. Sword of Destiny – Wild swords can land on reels 2, 3 and 4 and turn the entire reel WILD. Shield of Chance – Wild shields will fall down onto the spinning reels, the ones that land will become WILD. Arrow of Fortune – Arrows are fired towards the spinning reels. For every arrow that hits the reels, a 2x2, 2x3 or 3x3 of the same type symbol will appear on the reels.